Borislav Bisserov Mihaylov (Bulgarian: Борислав Михайлов) (born 12 February 1963) is a former Bulgarian football goalkeeper and currently President of Bulgarian Football Union, member of the executive committee of UEFA. He was captain of the Bulgaria national team during their surprising fourth-place run at the 1994 FIFA World Cup, as well their participation in Euro 96. 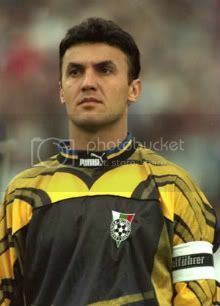 He also played at the 1986 FIFA World Cup and is currently the all-time appearance leader for the Bulgaria national team with 102 caps (60 as captain). He played for teams like Belenenses, in Portugal, and Mulhouse, in France. Borislav started his football career in 1981 and played for PFC Levski Sofia until 1989. He transferred to Clube de Futebol Os Belenenses, a Portuguese football club in 1989. In 1992 – 1994 he moved to France and played for FC Mulhouse. In 1995 he joined the then-English First Division team Reading for a then club record £800,000, replacing the departed club favourite Shaka Hislop. Apparently, he joined Reading after seeing the team play at Wembley in the 1995 First Division Playoff Final between Reading and Bolton Wanderers, believing the 80,000 capacity stadium to be Reading's home ground. However his time at the club was marked by a series of injuries, and his club career in England never took off.